Mt. Fuji stands at 3,776 m (12,388 ft) high and is surrounded by five lakes: Lake Kawaguchi, Lake Yamanaka, Lake Sai, Lake Motosu and Lake Shoji. They, and nearby Lake Ashi, provide excellent views of the mountain. It is part of the Fuji-Hakone-Izu National Park. It is also an active stratovolcano. The climate is very cold due to the altitude and the cone is covered by snow throughout the year. The lowest recorded temperature is -35.5C while on August 16th 2007 the highest temperature was recorded at 18.2 C.
The volcano is currently classified as active with a low risk of eruption. The last recorded eruption started on December 16th 1707 and ended about January 1st 1708 during the Edo period. This is sometimes called "the great Hōei eruption." Fuji-san spews cinders and ash which fell like rain in Izu, Kai, Sagami, and Musashi. At this time, a new crater, along with a second peak, named Hōei-zan after the era name, formed halfway down its side. Scientists are saying that there may be some minor volcanic activity in the next few years. 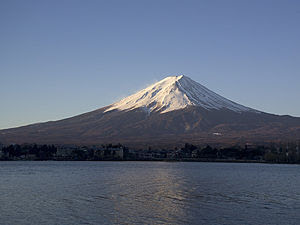 Mount Fuji is located at the point where the Eurasian Plate (or the Amurian Plate), the Okhotsk Plate, and the Philippine Plate meet. Those plates form the western part of Japan, the eastern part of Japan, and the Izu Peninsula respectively.